World GP was unique in that it deviated from most console racing games of its time. Instead of being an arcade-style driving game (such as Rad Racer, Al Unser Jr.'s Turbo Racing or Formula 1: Built To Win), World GP more closely resembled a simulation-style racing game. 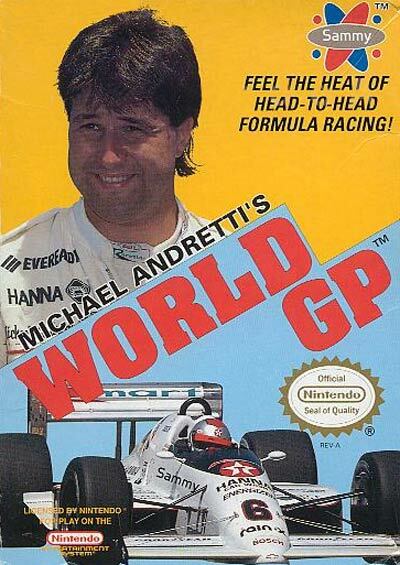 It was the first NES racing game to feature an entire field of real-life drivers (although all but Andretti had pseudonyms), and rather accurately depicted the sixteen circuits on the Formula One schedule. Four different cars were offered in the game, however, there were no car set-ups in the game, a feature most frequently associated with racing simulations. Compared to most console racing games of its time, World GP was much more difficult. The circuits were accurately depicted as having both sharp and wide turns, thus requiring players to slow down to certain speeds for corners, instead of most arcade-style games, which allowed players to unrealistically take turns flat-out. Gear shifting was also required for three of the cars (and notably for 8 of the 9 levels of the game), and some courses required dozens of gear changes per lap. Tire wear increased as the races went on, and players would be required to pit for tires at least once during each race to remain competitive.